Our Second Anthology Has Arrived! Hooray to the writers of the Afghan Women’s Writing Project! The writers, all Afghan nationals, took part in online workshops conducted in English by the Afghan Women’s Writing Project (AWWP). Their work was published first in English on our website. For most of these brave women, this is the first time that they will see their words printed in their own language, a rarity. It is truly the start of a quiet revolution powered by pens. Longtime AWWP writer Pari—known by first name only due to security concerns—translated the works from English to Dari with assistance by Afghan writer Ahmad Aria. The pieces in this collection cover such themes as marriage and family, love and forgiveness, education, and human rights. For many writers, including Pari, the act of putting pen to paper was literally an escape from their burqas. 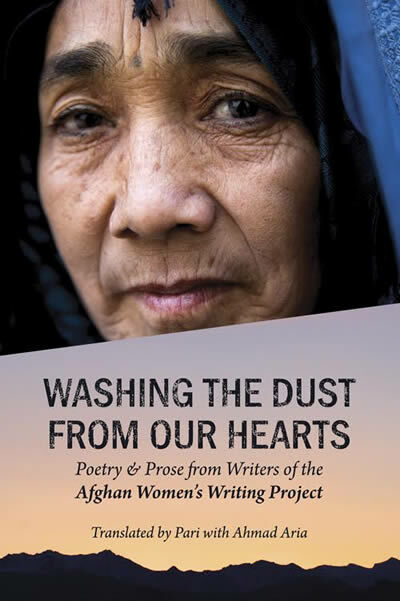 Afghan women are often told to stop writing, since women’s writing is often considered unworthy, and women are discouraged from participating in public life. By sharing their stories, the writers resist invisibility, and stand up for themselves and their families and communities. With their pens, they create a world where women’s voices are heard, and listened to; and a new destiny, fueled by a new literature, emerges for future generations. Founded in 2009 by American journalist Masha Hamilton, the Afghan Women’s Writing Project strives to give women the basic human right to tell their own stories—a right that has too often been denied. Through online writing workshops led by international writers, educators, and journalists, AWWP empowers women in seven of Afghanistan’s 34 provinces. Poems and essays are published in an online magazine that carries the writers’ voices to a global audience. Writing eases the mind. I know, it saved me as a child and a teen. It let’s the restrained energy run free. I came across this website by chance, doing research about Afghanistan. You need more publicity, because everybody needs to know your thoughts and the pain this endless war has imposed on the people of Afghanistan. Over hundreds of years your country has been wronged and battled by invaders who had no right to interfere, only serving their own interests. Will it ever stop? I know no other country that has been shaken as permanently as Afghanistan. My respect to all of you. You will make a difference. And as a mother, may I say without sounding too pathetic, that the peace process on this planet goes through our wombs, because why should we allow that our children get slaughtered on the battleground? Why should we stand by and watch as our boys and girls get murdered or become murderers? My eight year old son said, “If you want to have peace, you have to stop the killing.” Half of the planet’s population is female. And we can stop the killing if we stick together, across borders and across religions, if we speak up. What we all have in common is the love for our children. Because no one has the right to send our children to their death.